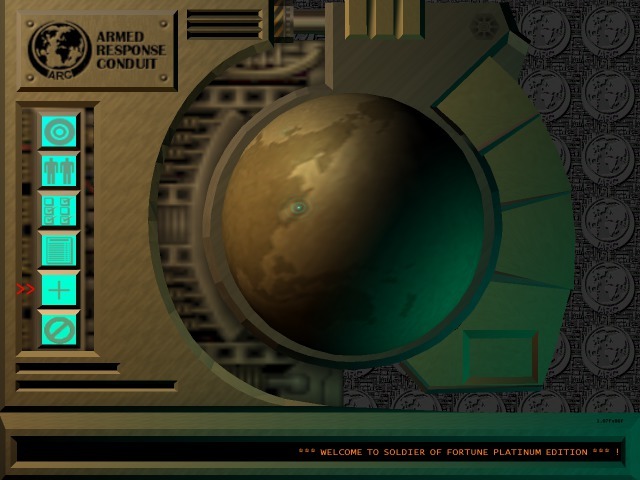 SoFplus is a mod for Soldier of Fortune 1.07f. It supports SoF1 clients or SoF1 dedicated servers. Non-dedicated servers are not supported. The client and server mods can be used independently of each other. The primary purpose is to fix SoF1 1.07f bugs. An unpatched SoF has a number of vulnerabilites that allow a remote attacker to take over your PC. SoFplus blocks all known exploits. 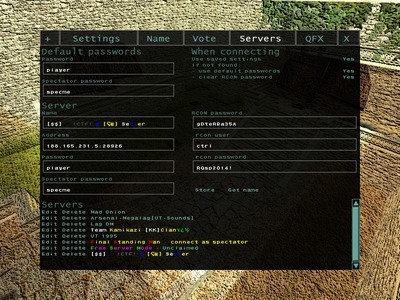 Without SoFplus, your SoF server or client can be crashed or hacked. It's even possible to take over your entire PC. New commands and cvars for improved scripting capabilities. Several example scripts are provided inside the pakfiles. Force full-violence mode by default. No more annoying connection refused / violence settings are incompatible messages. Enable console by default. 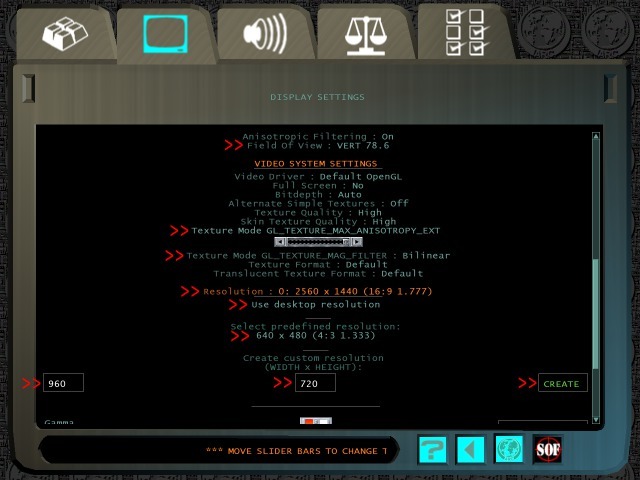 Just press '~' or 'ESC' to enable the console. Screenshots in PNG format instead of TGA. Mumble positional audio. To configure Mumble for positional audio: Go to the 'configure', 'settings' menu. Check 'advanced'. Check 'Link to Game and Transmit Position'. Enable 'Link'. 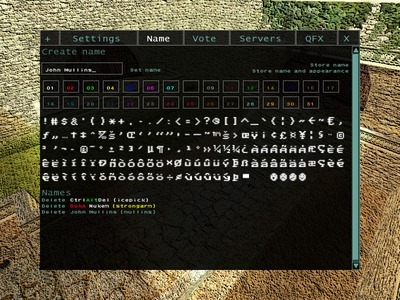 Look at the Mumble website for more information. The violence lock button on the main menu has been replaced with a SoFplus button. 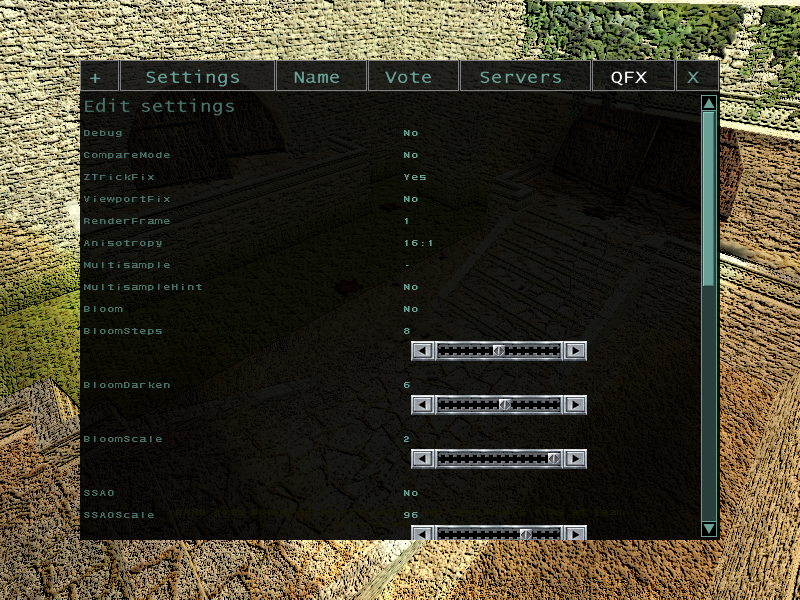 If you want to restore your main menu to the defaults, delete sofplus-optional.pak from the base directory. 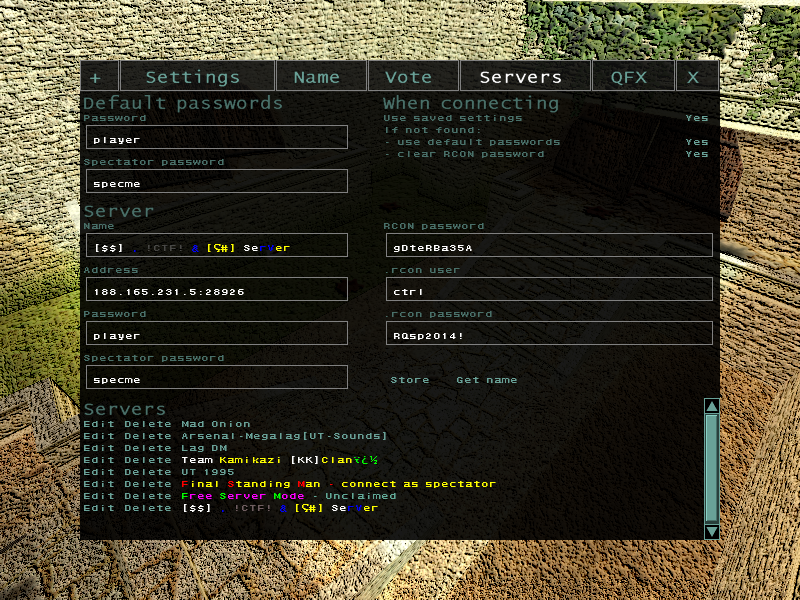 You will still be able to access the SoFplus menus by typing 'menu spm' in the console. 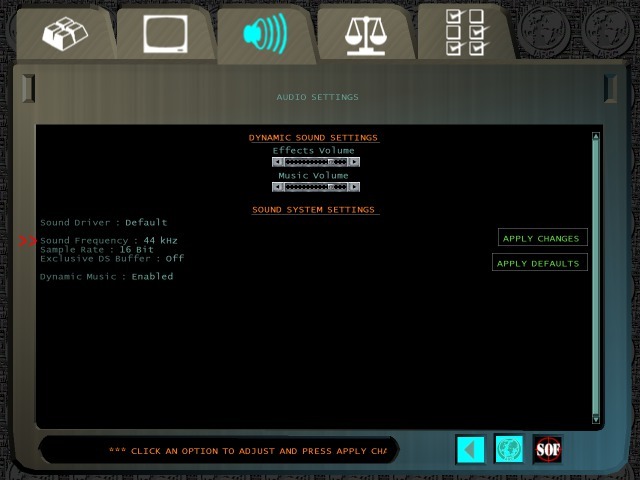 The sound frequency setting in the audio settings can now be changed to 11, 22, 44 and 48 kHz. At 44 or 48 kHz, you may experience some sound and dynamic music issues. If that is the case, disable dynamic music or switch to 11 or 22 kHz. 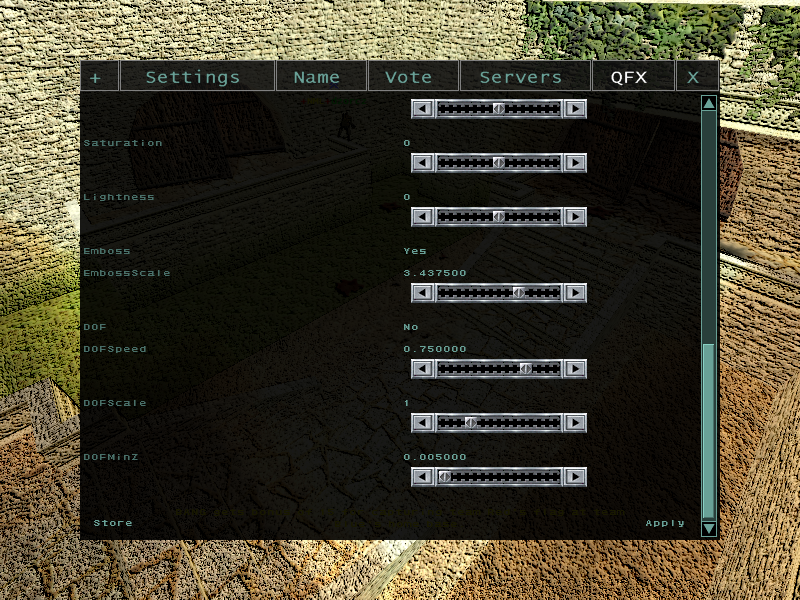 The video settings menu has been overhauled to allow custom video modes and FOV settings. Two extra texture settings have been added for better looking graphics. 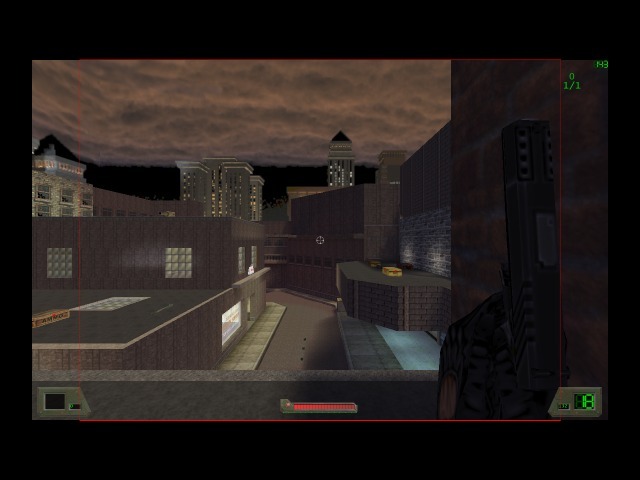 0: Horizontal FOV is forced to 95.0. Vertical FOV is adjusted automatically. This is what SoF does by default. This scaling method is known as vert- on the Widescreen Gaming forum. 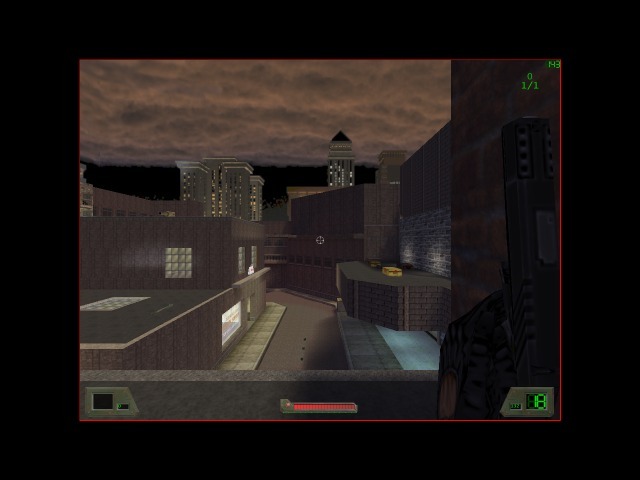 1: Vertical FOV is forced to 78.6. 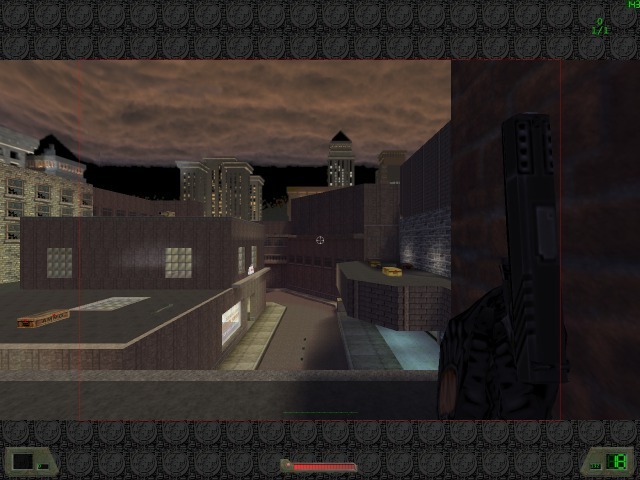 Horizontal FOV is adjusted automatically. This scaling method is known as hor+ on the Widescreen Gaming forum. 90 .. 111: Horizontal FOV is set the the specified value. Vertical FOV is adjusted automatically. The images below show how FOV affects the amount of information that's on the screen. 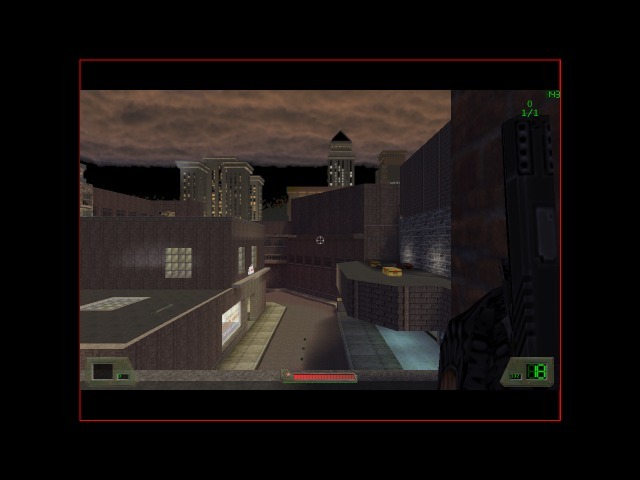 The red box indicates what area would have been visible with an aspect ratio of 4:3 and horizontal FOV of 95 (SoF default settings). You can play SoF on a multi-monitor setup. Here's what I used for three 1440x900 monitors (not their native resolution, but this is the highest resolution they all have in common). On my setup the primary display is the in the center, which is why vid_xpos has to be shifted 1440 pixels to the left. Two 1920x1080 monitors (3840x1080). Never use an even number of monitors like this, because the center of the view (what you aim at) will be at the edge of two of the monitors. I've patched all menus to support widescreen aspect ratios up to 16:9. Multi-monitor setups have much wider aspect ratios (like 24:5 in my 4320x900 example). I could make a patch for that if someone actually needs it. There's two ways to work around this: Temporarily switch to a different video mode via the console (e.g. gl_mode 3) or simply use the console to do what you want to do (e.g. connect 5.135.46.179:28914). To get rid of the Windows taskbar, you have to reconfigure your taskbar and uncheck the 'Keep the taskbar on top of other windows' setting. I could make a patch for that if someone actually needs it. New commands and cvars for improved scripting capabilities. A large amount of example scripts are provided. Customizable map entities to add/edit/remove fix spawn points, weapons, ammo etc. on existing maps. SoFplus server 20140531 is the latest version. If you are upgrading from 1.4t* versions: Almost everything changed, so you can't simply upgrade from 1.4t* by just replacing files. Try to install and configure it on your home PC first before installing it on a rented server. If you are upgrading from the 2012*/2013* versions: The scripts have been modified and have been moved from user-server/sofplus/ to user-server/sofplus/addons/. 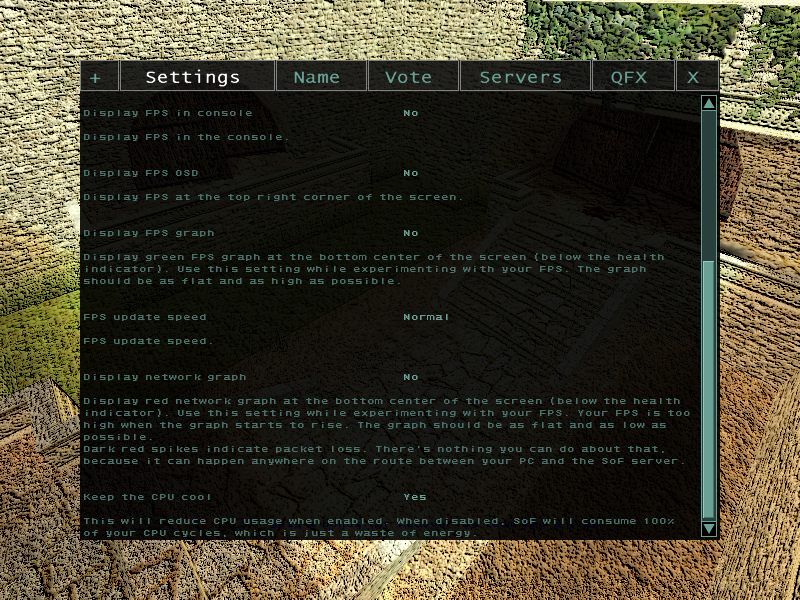 The spawn files have been moved from user-server/sofplus/sv/spawn/ to user-server/sofplus/spawn/. Try to install and configure it on your home PC first before installing it on a rented server. If you want to run your server with full violence, start your server with commandline option '+set sv_violence 32' (in sof-server-start.bat), or set the cvar _sp_sv_violence_lock_override in sofplus-cvars.cfg to 1.
sofplus-client-patch-20140531-gog.zip (GOG version) SoFplus client 20140531. SoF1 version 1.07f is required. You may want to look at the installation instructions / changelog first. If the generated .zip file can not be extracted because of CRC errors, try the other version of the patch (CD-rom / GOG.com version). sofplus-server-patch-20140531-gog.zip (GOG version) SoFplus server 20140531. SoF1 version 1.07f is required. You may want to look at the installation instructions / changelog first. If the generated .zip file can not be extracted because of CRC errors, try the other version of the patch (CD-rom / GOG.com version). SoFplus releases All SoFplus releases. All old downloads have been disabled because of an Activision complaint. SoF materials have been removed from the 20140531 patch version. Client addons Old client addons. Server addons Old server addons.